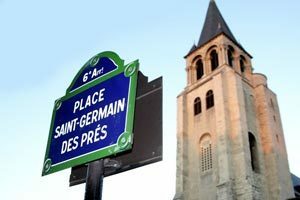 Saint-Germain-des-Prés, a mythical quarter where one comes to take a rest at one of Café de Flore’s tables, leaf the pages of a novel in front of the Abbey of Saint-Germain-des-Prés, or wander through the luxury boutiques like Louis Vuitton or Sonia Rykiel. While the quarter resonates from the sound of its cobblestones and its history, the Hôtel Des Deux Continents tells the story of Rue Jacob. The treaty of Paris, giving independence to the United States of America was signed on this road in 1783, as is displayed in a superb fresco of New York in the breakfast suite. 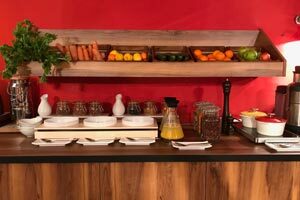 On the floors above, the calm and comfort of the rooms guarantee a well deserved rest from the wild Parisian adventure. 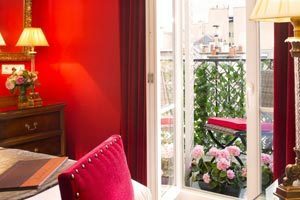 Hôtel calme et idéalement situé au coeur de Paris. Hôtel situé dans un quartier très vivant et central. Malgré cela les chambres sont au calme et on y dort très bien. Litterie impeccable. L’hôtel est bien situer à quelque km du Louvre et de la Rue de Rivoli. Personnel agréable.